One way of getting published is to enter your work into writing competitions. Winning an award is the way many top New Zealand poets and writers have started their careers. The Smart Alex creative writing competition is sponsored by The Friends of the Turnbull Library Ngā Hoa o te Whare Pukapuka Turnbull. Entry is free and there is $3,000 in prize money. They invite a personal response from you to an item in the collections of the Alexander Turnbull Library. Your response (or interpretation) can be a piece of creative writing, a poem, an illustrated graphic story, or the written lyrics for a song or waiata. To get you going, they have selected a range of images from the Library’s collections that may spark your imagination. If you want to explore for yourself, you can search online to discover something else in the Alexander Turnbull collections that inspires you. Entry is open to anyone currently attending a secondary school in New Zealand or in the Pacific Islands. There are two age-group categories for entries: Years 9-10, and Years 11-13. Submit your completed entry by 5pm on Sunday 21 July 2019. Results will be announced on Thursday 19 September 2019. Smart Alex Competition for Secondary Schools. 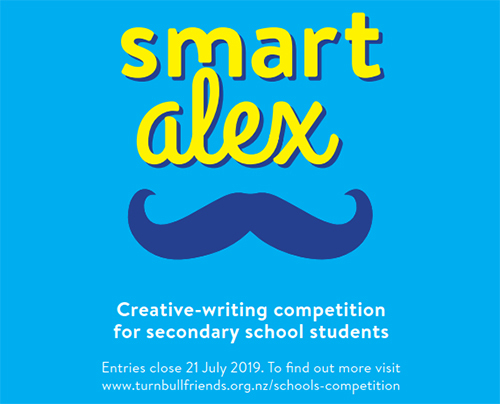 Enter the 2019 Smart Alex creative writing competition for secondary school students. Landfall runs the Charles Brasch Young Writers' Essay Competition, an annual award open to writers aged 16 to 21. Essays should not exceed 1500 words. The winner will be announced and published in each May issue of Landfall. The winner receives $500 and a year’s subscription to Landfall. Entries for the 2019 Charles Brasch Young Writers' Essay competition open on 1 December 2018. The closing date for receipt of entries is 31 March 2019. Find out more: Charles Brasch Young Writers' Essay Competition. There are 3 prizes in the Youth (18 and under) category of the National Flash Fiction Day Competition: First Prize: $200; Second Prize: $100; Third Prize: $50. Send your best 300-word story. The 2019 National Flash Fiction Day Competition runs 15 February to 15 April 2019. Winners will be announced 22 June at the National Flash Fiction Day celebrations, and all winners are invited to attend and share their stories. Find out more: 2019 National Flash Fiction Day Competition. The National Schools Poetry Award is held annually. It is free to enter and open to Year 12 and 13 students across New Zealand. Entries are now open for the 2019 National Schools Poetry Award. Entry deadline: 8 July 2019. The winner and nine finalists will win cash and prizes for their poems (there is a $500 cash prize for the winner, and a $500 book grant for the winner’s school library), plus an invitation to attend an exclusive masterclass with leading New Zealand poets at the IIML on Wellington's Victoria University campus. Find out more: National Schools Poetry Award. The Pikihuia Awards (formerly the Huia Short Story Awards) is a biennial competition that started in 1995 to discover and recognise Māori writers. The awards encourage diverse Māori viewpoints and writing in both te reo Māori and English. Each award category is open to adults and school students. Entries are open from 1 January until 8 April 2019. Finalists will be announced on 19 June, and the winners announced at the Pikihuia Awards Ceremony on 14 September. Find out more: Pikihuia Awards. Re-Draft is a nationally acclaimed collection of teenagers' writing, published each year by Clerestory Press. Any New Zealand teenager can enter their work using the form found in the back of the current edition of Re-Draft. Entries can be any creative writing genre and will be judged by award winning New Zealand writers. Read the guidelines. Entries are open until 1 September 2019. Results and the winning story will be published online in Takahe 96 (August 2019) and all entries will considered for publication. For poems written by any young poet aged 11 to 17. Each year 100 winners (85 commendations and 15 overall winners) are selected by a team of high profile judges. Free entry. Find out more: Foyle Young Poets of the Year Award.